Spring in Arizona brings plenty of all-star players to the desert, but they aren’t all found on a baseball diamond. 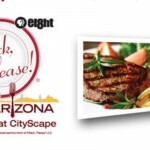 Some of them are found in the kitchens of Arizona’s best restaurants and this weekend, you’ll find an all-star lineup of the Valley’s top chefs at Eight’s Check, Please! Arizona Festival at CityScape in downtown Phoenix. 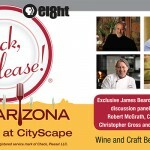 Based on Eight’s award-winning, locally-produced dining show hosted by Chef Robert McGrath, the event will feature an impressive roster of Arizona’s culinary talent, along with samples from more than 25 local restaurants. McGrath takes the manager’s role at the event, hosting the Culinary Leadership and James Beard Award Winners panel discussions. Check, Please! Arizona. Eight, Arizona PBS’s #1 most popular program airs Thursdays and Saturdays. 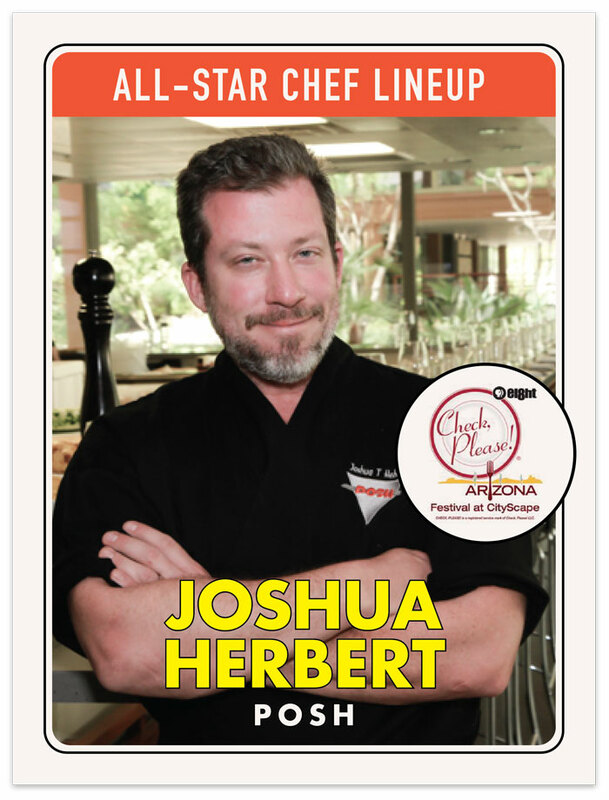 Nominated five times by The James Beard Foundation as “Best Chef in America: Southwest” HE WON THE HONOR in 2001. Touted in Food & Wine as one of the Ten Best Chefs in America. 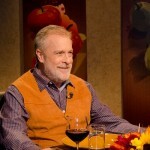 Author of the popular cookbook, American Western Cooking from the Roaring Fork. Chef de cuisine at the Four Seasons Hotel in Austin; executive chef of the Four Seasons Hotel in Houston; and chef/owner of Sierra Grill in Houston, and Brio Vista in Austin. 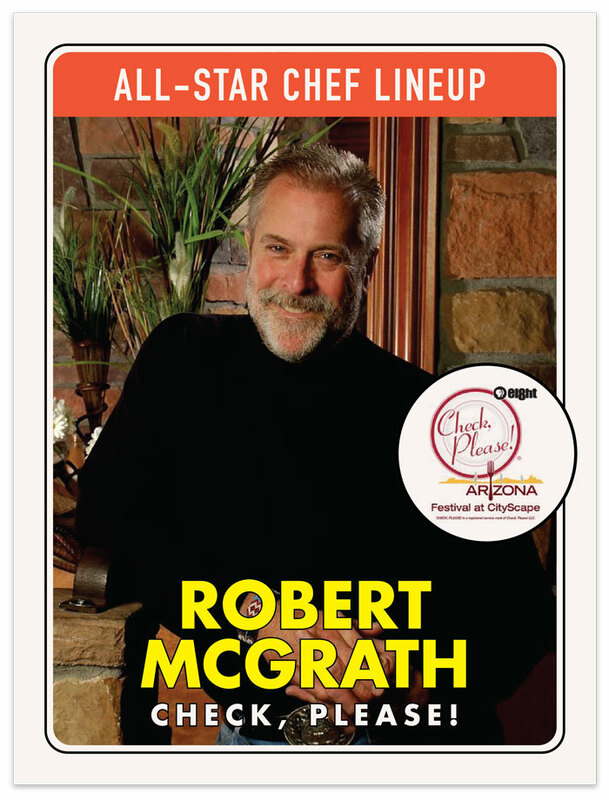 McGrath won the Lifetime Achievement Award from the Arizona Culinary Hall of Fame in 2013. A James Beard Award-Winner in 2003 and creator of the “Best Pizza in the Country” according to publications like Bon Appétit and Vogue, as well as many celebrity aficionados. Bianco is currently on a mission to bring his organically grown Bianco DiNapoli Tomatoes to food-lovers everywhere. 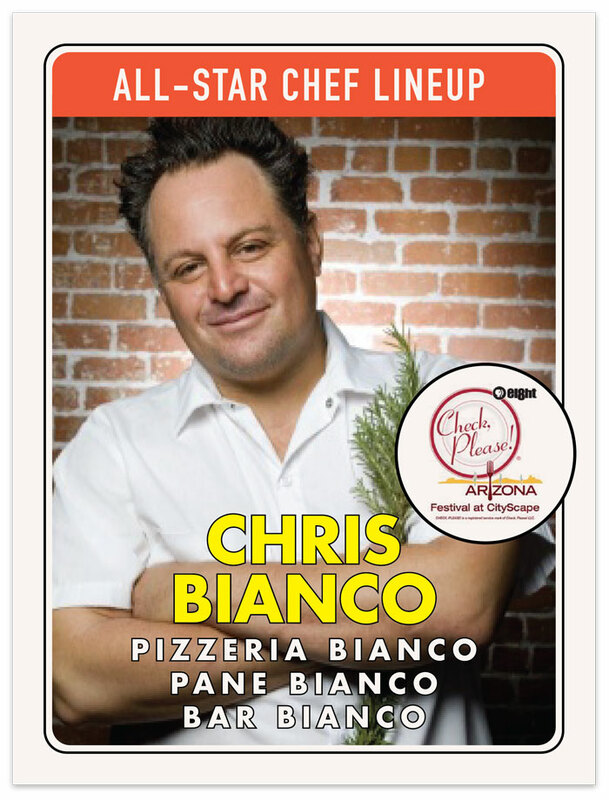 Bianco won the James Beard Foundation Honor of Best Chef in America: Southwest in 2003. Chef Bianco also travels to London to check in on his restaurant Union Jacks – created with Jamie Oliver. His latest endeavor is Bianco DiNapoli Tomatoes. Their mission is to bring you the very best tomatoes that Mother Nature and human ingenuity has to offer. Organically grown, hand selected, grown and processed in California. Bianco recently birthed a Pizzeria Bianco in Tucson, and a daughter! 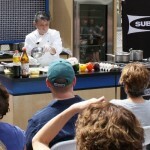 Fukuda is a 2007 James Beard Award Winner. 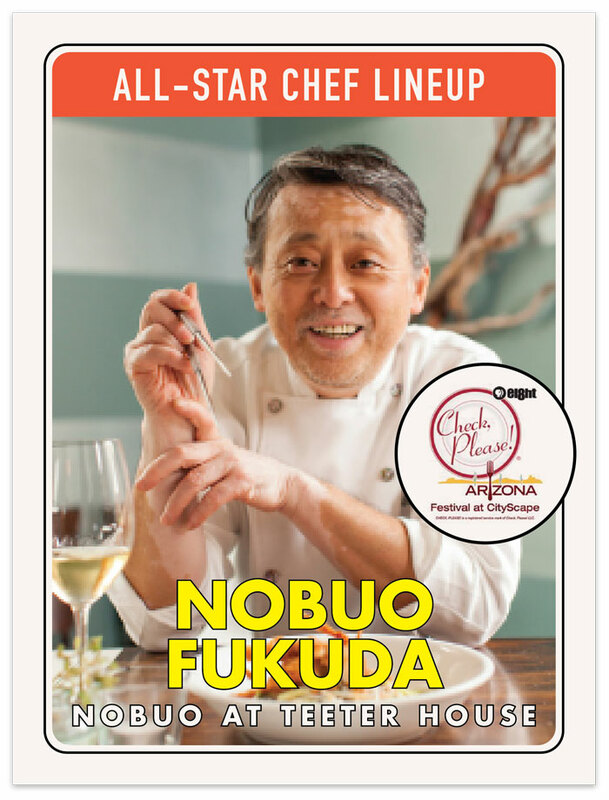 Originally hailing from Tokyo, Japan, he’s been delighting Arizona foodies with innovative Japanese cuisine for the past 30 years. At Nobuo, he is famous for his omakase dining experiences, which leaves the menu selection up to the chef. Chef Nobuo first gained recognition for his East-meets-West approach at Restaurant Hapa and went on to win the James Beard Award in 2007 when he opened his restaurant Sea Saw. At Teeter House, in Heritage Square, Chef Nobuo comes full circle, elevating (and sometimes re-inventing) Japanese cuisine, while offering the same wildly inventive omakase for which he’s famous. The historic Teeter House is located in the must-see Heritage Square. 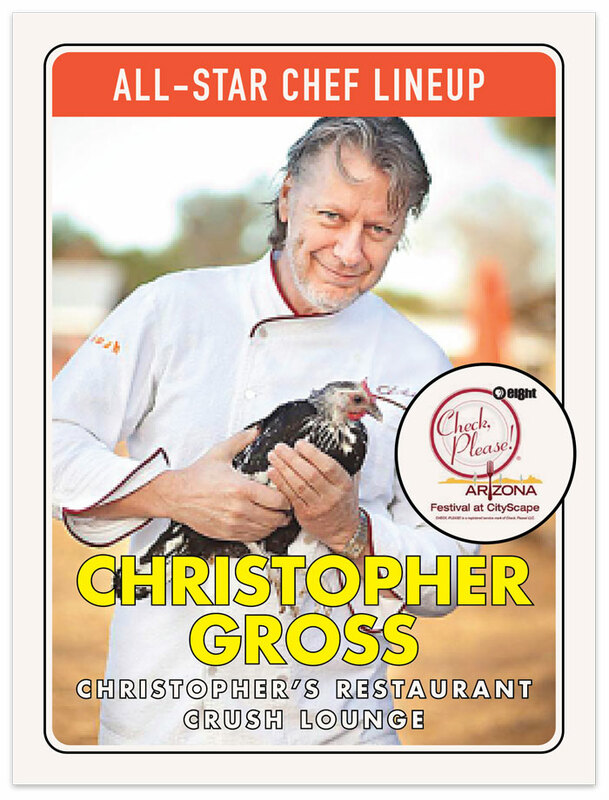 A longtime Arizona culinary staple, who brings experience from around the world to his kitchen. Gross was awarded the James Beard Foundation’s Best Chef in America: Southwest” in 1995. He has become a dominating figure in the culinary world, consulting regularly for Club Med, Crystal Cruises, Cunard Cruise Lines, Disney and others. 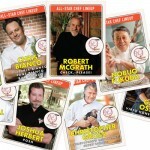 Featured on panels with Jacques Pepin and Julia Child at the Food & Wine Classic in Aspen. He was a featured chef for the James Beard Foundation Dinner of the Decade, “A Salute to Peter Kump”; and the 2002 Salt Lake Winter Olympic Games. Gross has cooked for at least 3 presidents, and many other global leaders. 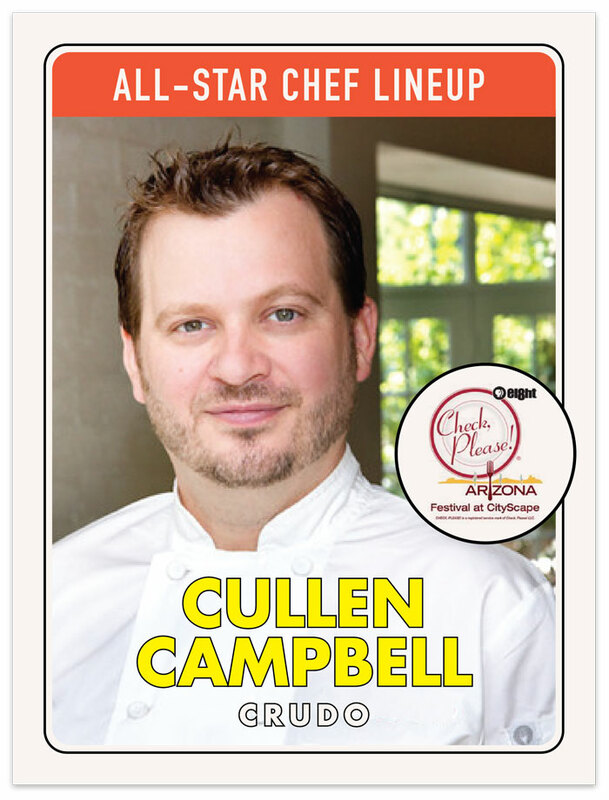 Campbell’s Crudo has received national acclaim and was named “Chef of the Year” by the Arizona Culinary Hall of Fame. Chef Cullen Campbell, of Crudo, has quickly made an indelible mark on the Arizona dining scene. 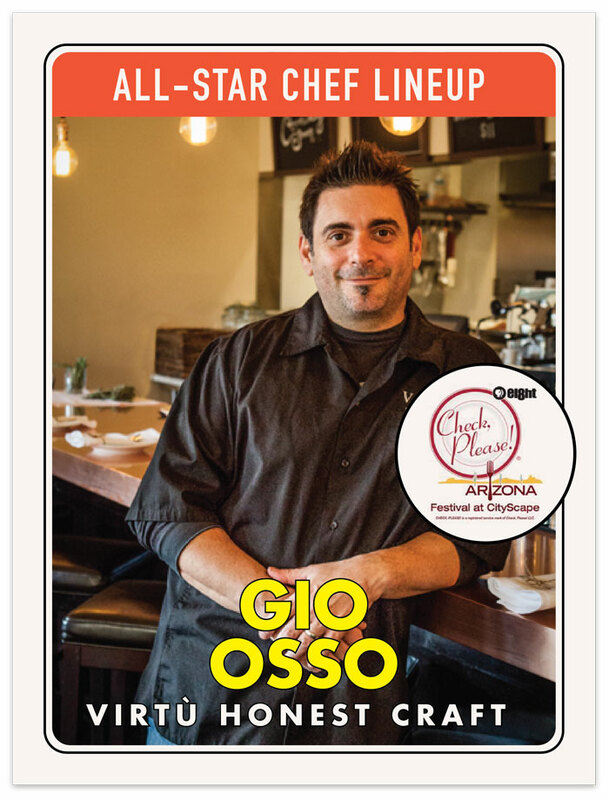 Since opening In April 2012, Phoenix Magazine named Crudo the #1 new restaurant in Phoenix and food critic Howard Seftel of Gannett’s Arizona Republic gave the restaurant 4.5 stars out of 5. In April, 2013, Chef Cullen was invited to cook dinner at the prestigious James Beard House in NYC as well as named “Chef of the Year” by the Arizona Culinary Hall of Fame. Campbell is set to debut another restaurant this Summer. Stay tuned! Chef Joshua Hebert became enamored with food at an early age. And he already was cooking professionally while in high school at a corporate Italian restaurant. But he had his sights set on fine dining. He spent five years as a line cook and sous chef at Tarbell’s developing his skills. He opened POSH Restaurant on New Year’s Eve 2008, and continues to receive accolades for his innovative approach. The Arizona Republic has named POSH one of the top 10 gourmet restaurants in the Phoenix area. 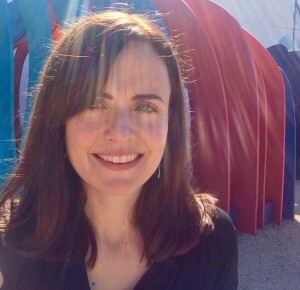 Hebert is a certified sommelier, and serves on the Arizona Restaurant Association board of directors. With a focus on Mediterranean cuisine, seafood and pastas, Osso’s Virtù was a James Beard Award semi-finalist for Best New Restaurant and named in the 20 “Best New Restaurants” in the U.S. by Esquire Magazine. Chef Gio Osso’s already acclaimed restaurant, Virtù, was named one of the top 20 “Best New Restaurants” in the U.S. by Esquire Magazine and also was a James Beard Award semi-finalist for Best New Restaurant. Virtù Honest Craft is tucked inside Old Town Scottsdale’s Bespoke Inn, where his menu features contemporary cuisine inspired by his Mediterranean roots and global influences. At Virtù, the Machiavellian term for achieving excellence, expect a menu that changes almost weekly, featuring house-made pastas, superb seafood, new Mediterranean creations and rustic favorites. The boutique Bespoke Inn also houses a boutique bicycle shop. What: Eight’s Check, Please! Arizona Festival Click to link to see the full list of participating restaurants. When: Sunday, March 22, 11 a.m. to 3 p.m.